I’m currently in the midst of experiencing a little taste of what it may feel like to be an “empty nester” down the road in the not-to-distant future. With my “bird” — my son — off to encampment for Civil Air Patrol for the next week; it’s only my hubs and I and our little dog-daughter, Lola, holding down the fort here, so to speak. Things are quiet when a child is not around; a little too quiet. Now, there’s no hungry belly in the middle of the summer day to prepare some lunch for; no need to check my phone in the evening for texts letting me know that he’s on his way home from biking with his friends, or that he’ll be staying out for another half hour. There’s no one watching a little TV on the couch and offering me a chipper “Hi Mom! How was your day! ?” when I walk in from work on these blazingly hot, dog-day afternoons, and no one to mildly frustrate with my requests to take the garbage bins out and put them next to the curb for the next day’s pick-up, at the most inopportune time. There’s a smidgen less brightness in our home this week, a little less light. What can I say? I’m a mom, through and through. Our boy is off right now, “roughing it” in his own right with his fellow cadets, and I wait here in eager anticipation of his return at the end of this forever-dragging-on week. I wait with anxiousness to wrap my arms around him again and give him a big squeeze and tell him that I love him; I wait with baited breath to let him know how proud of him I am for getting through a surely uncomfortable-at-times week, and to simply show him that he is cherished. But there’s a certain peacefulness also present in my anticipation, a gentle sweetness in basking in it a little. Because, though it’s difficult to wait for the end of something to come and for a reunion to take place, when it does, it just tastes that much better — appreciation sets in, and a fullness of enjoyment takes place. It reminds me a little about how it feels to have to wait to taste some sweet, chewy, white chocolate-raspberry “platinum blondie” bars as they bake away in the oven, slowly rising and getting ever-closer to being the perfect sweet treat, as I squat next to the oven door and eagerly peer at them through the little window as they go through their process. My, can anticipation be sweet, indeed. Just as it is true with certain moments in life, there is such wonderfully rich anticipation to be found when we create with food. We wait for months for this warmer season to arrive, a season that is replete with bountiful fruits and colorful offerings — fresh offerings — so that we can take a little pleasure in reuniting with them and enjoying their sweet flavors while they last for just a little while. Tempting desserts are dreamed up and then prepared, and we anticipate just what they’ll taste like once they’re perfectly ready for us to partake in them. The characteristic of each ingredient is scrutinized in the imagination — the fragrant vanilla, the creamy white chocolate, the tart, fresh raspberries — all blending together to form the total experience of eagerly waiting for and then finally getting to enjoy something of the sweet sort, in all of its fullness and perfection. 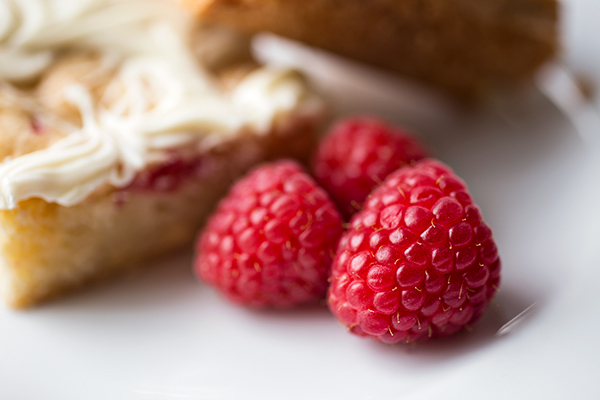 So as I wait in eager anticipation for my “bird” to return back the nest, and as I create and prepare a decadently delectable summer-inspired batch of White Chocolate-Raspberry “Platinum Blondie” Bars with gorgeously red, fresh summer raspberries, I’ll try my very best to just enjoy this present moment of slight longing; because making good friends with anticipation — basking in it a little — makes the completed experience a delightfully sweet one for the soul at the end of it all. -Preheat the oven to 350°, and line a 11 x 7 x 1.5 inch glass baking dish (or 2 quart) with a piece of foil that over-hangs slightly over the sides of the baking dish, and lightly mist with cooking spray. -In a small bowl, combine the flour, the baking powder and the salt, stir to blend, and set these dry ingredients aside for just a moment. -To prepare your batter, add the sugar and the eggs to a medium size bowl, and with a hand-held mixer, beat the two together on medium-high speed for about 2 minutes, or until a very pale yellow, and thick and creamy. -Next, add the melted butter to the egg/sugar mixture a little at a time, and using a spatula or wooden spoon, blend it into the eggs/sugar until completely incorporated; add in the vanilla extract, and stir to combine. -Next, add the flour/baking powder/salt mixture into the eggs/sugar/butter mixture, and stir to combine; once almost completely blended, add in 6 ounces of the white chocolate chips, and fold those in to incorporate them completely. -Pour about half of the batter into the foil-lined baking dish, then top that as evenly as possible with the chopped raspberries; pour the remainder of the batter over the raspberries, then very gently and carefully “swirl” the batter to blend it with the berries, being careful not to break up the berries too much more. 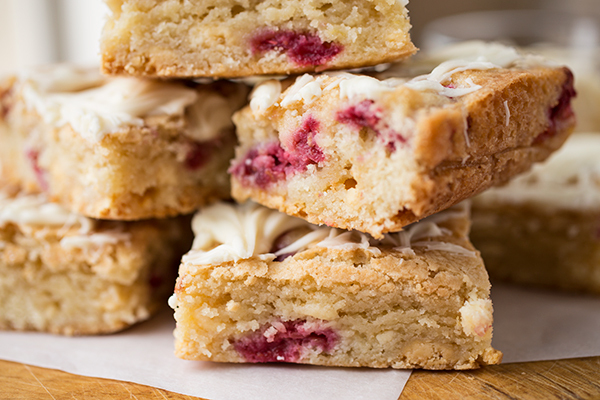 -Bake the blondies for 36-38 minutes, or until a toothpick inserted into the center comes out clean and the blondies are lightly golden on top; allow to cool for about 10 minutes in the baking dish, then using the over-hanging foil, lift the blondies out of the baking dish and allow them to cool completely. 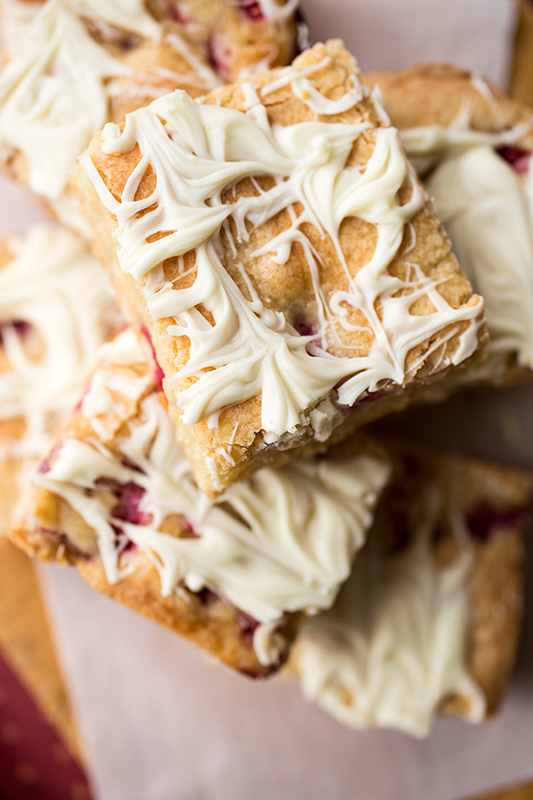 I love the drizzle of white chocolate. these bars sound delish! Nice recipe. Thank you and have a safe day. 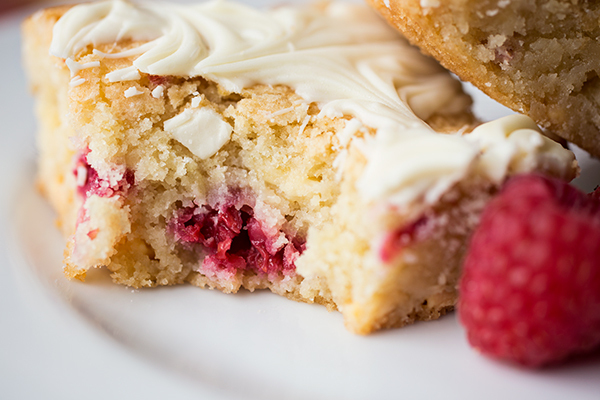 These are quick, easy, beautiful and (most importantly) delicious! Thanks for another great recipe! It’s my pleasure, Lauren – thanks for stopping by to let me know you enjoyed these yummies! I was looking for a dessert for my father-in-law’s birthday. 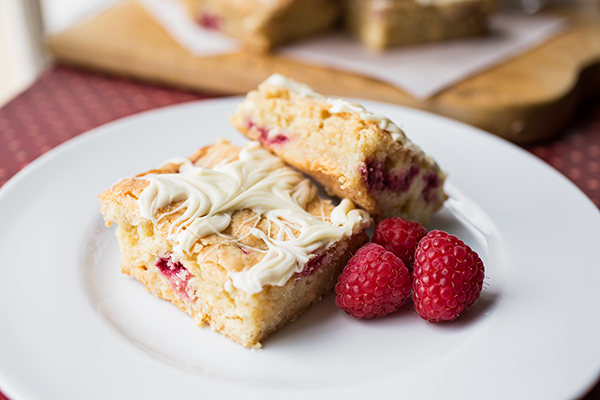 I wanted something with white chocolate and raspberries as he loves both! I feel like you wrote this recipe just for him 🙂 Can’t wait to try it! Can I use brown sugar instead of granulated sugar ? Hi Farheen, certainly use anything that you prefer; may be a bit darker and moister, but that should still work. Do you think frozen berries would work? I’m thinking put them in frozen, so they would release liquid as they bake? 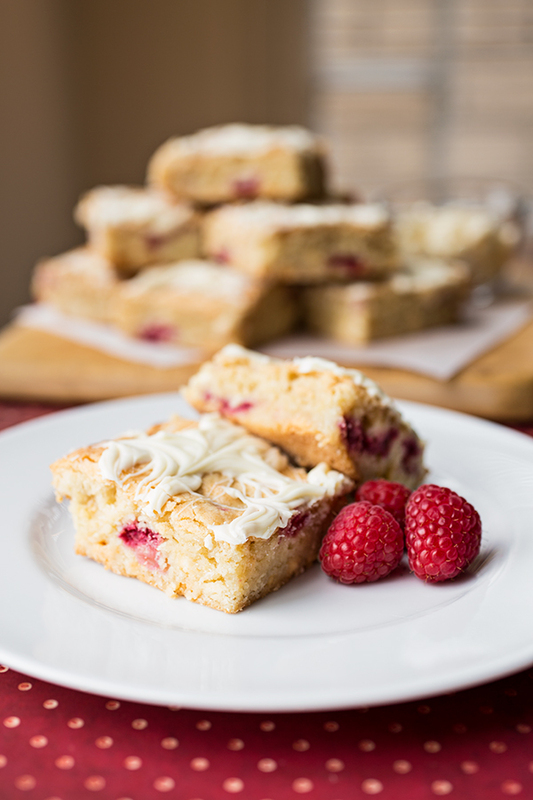 I recently tried these in an attempt to recreate the blondies that were served as part of dessert table at our wedding (I won’t say it too loudly but I think these may just be better than the ones we had at our wedding!). Hi Catherine, I’m thrilled you enjoyed these so much! (I’m totally tickled that you say they may even been a little better than the ones at your wedding 😉…) Thank you so much for sharing your experience with the frozen berries, as well.